Portobello burgers substitute juicy, fat slices of grilled portobello mushroom for hamburger patties. They make great vegan and vegetarian substitutes for a traditional burger and fries meal. Consider the humble hamburger. When gourmet food comes to mind, an all beef patty, sandwiched between two sesame seed buns doesn't usually conjure up white tablecloths, golden utensils and finger bowls. Rather it makes you think of drive through windows and plastic forks. Yet savvy restaurants elevated the hamburger to cult status by adding delectable toppings such as blue cheese, sliced fancy onions, and special sauces. It was only a matter of time before gourmet meats such as bison and ostrich, replaced all beef patties. 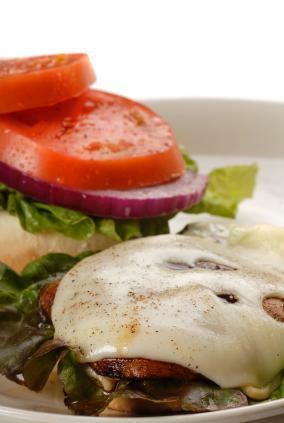 Portobello burgers simply took the evolution of the hamburger into the fungi realm. Portobello mushrooms are simply cremini mushrooms that have been allowed to grow to maturity. These large mushrooms make good sandwich or burger meat substitutes because of their meat-like texture. When mushrooms are used in lieu of beef patties in portobello burgers, they're usually sliced thick, brushed with oil, and char-grilled to perfection. The charcoal fired grill adds a smoky barbecue flavor to the mushroom, and the thick, meaty texture fools even the most hardened carnivores. Making portobello burgers is fairly simple and straightforward. Most recipes pack an extra flavorful punch into the toppings. Review the basic recipe first, then take a look at the suggested add-ons for additional flavor. Most recipes work well for vegetarians, but vegans will want to watch out for cheese that's added to some recipes since it's not on a vegan diet. Preheat the barbecue grill to medium. Clean the mushrooms, then slice off the stems. Create thick slices from the big mushroom caps. Mix one tablespoon of olive oil with the crushed or pressed garlic. Brush the mushroom caps with the garlic and olive oil mixture. Add salt and pepper to taste. Place the caps on the grill and grill each side until tender. It will take about 10 minutes to grill the entire mushroom cap, but check it and turn the caps occasionally. When the portobello mushrooms are thoroughly grilled, brown the rolls. Place the mushrooms on the rolls and serve. Portobello and herbs: Grill the portobello mushrooms and rolls according to the basic recipe. Spread mayonnaise to taste on the roll. Add the grilled mushroom, them top with herbs such as basil or chives. Romaine lettuce or even a few baby spinach leaves and tomatoes also go great with this classic dish. Burger joint burger: Grill and assemble the classic portobello burger. Add tomatoes, onions, lettuce and mayonnaise and ketchup to the top. Adding a slice of cheddar or American cheese makes it a cheeseburger! Care 2 offers delightful vegetarian burger options. They've vegan too if you hold the mayo. The Food Network offers a smoky roasted pepper and mozzarella mix burger that's a little taste of Italy on a bun. At Epicurious, a rosemary-infused portobello burger tinges this dish with a gourmet flavor. Balsamic vinegar and blue cheese add a kick to this class recipe on My Recipes.